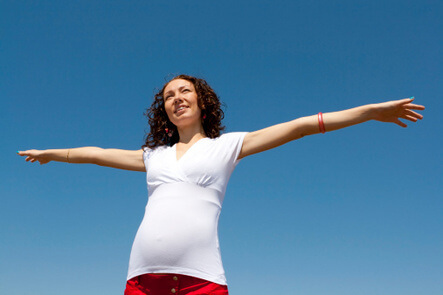 Adequate vitamin D levels are very important during pregnancy and lactation. In addition to the classical role of vitamin D in calcium and phosphate absorption and metabolism, vitamin D during pregnancy protects against infection, helps ensure proper fetal development, and reduces the risk of adverse pregnancy outcomes. How vitamin D protects against infection is discussed in another blog. Infection during pregnancy has been linked to adverse effects on fetal development, so is to be avoided if possible. Vitamin D helps with fetal development not only through calcium and phosphate effects but also through effects on gene expression. Vitamin D affects the expression of hundreds of genes, turning some on, turning others off. Since fetal development is controlled to a large extent by genes, this is a very important role for vitamin D.
A number of adverse pregnancy outcomes have been linked to low vitamin D levels. One study found that the risk of primary Cesarean section delivery increased as vitamin D levels decreased. One role of vitamin D is to strengthen muscles, which may help explain why vitamin D reduces risk of primary Cesarean section delivery. Several studies have reported increased risk of gestational diabetes for those with low vitamin D levels. Vitamin D also reduces risk of both type 1 and type 2 diabetes mellitus. Lower vitamin D levels are also associated with increased risk of pre-eclampsia. Other studies have found links between vitamin D deficiency and both preterm delivery and small birth weight. These effects are more common among black-Americans, who have lower vitamin D levels than white Americans primarily due to having darker skin. Black-Americans are also more likely to have infants with rickets. Another frequent development during pregnancy is periodontal disease. Those who develop periodontal disease during pregnancy often have adverse pregnancy outcomes. There is mounting evidence that vitamin D reduces the risk of periodontal disease. Thus, periodontal disease during pregnancy can be considered a warning sign of vitamin D deficiency. The benefit of high vitamin D levels during lactation is that the nursing infant gets its vitamin D directly from the mother rather than having to take supplements. Most of the findings just discussed are from observational studies. Health policy makers prefer randomized controlled trials to observational studies. One such trial was reported in 2011. The pregnant women were given as much as 4000 IU/d vitamin D3. The researchers found that it took 4000 IU/d to increase vitamin D levels to above 40 ng/ml, which was high enough to raise the active form of vitamin D to the optimal level. The active form of vitamin D activates gene expression and protects against infection. There were no adverse effects such as extra calcium in the blood or urine. They also found that those taking 4000 IU/d had significantly reduced risk of primary Cesarean section delivery and pre-eclampsia. They had too few women enrolled to find significant results for other pregnancy outcomes.